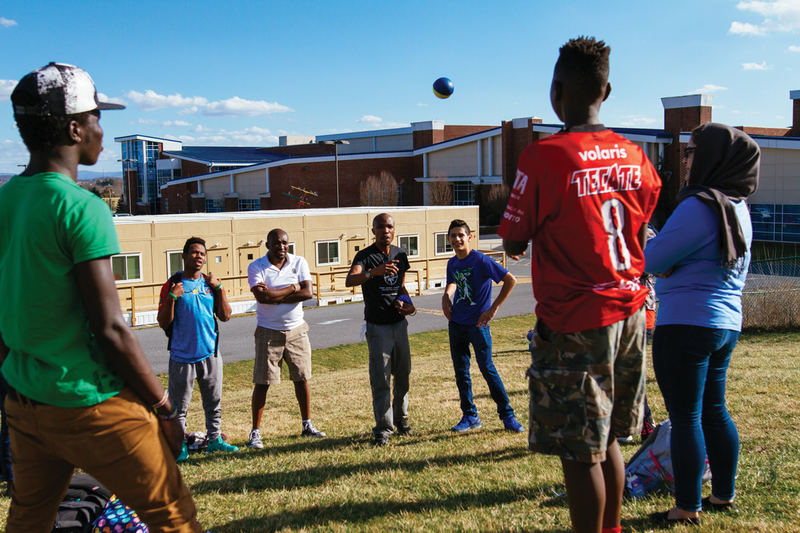 Peer Leaders at Harrisonburg High School play a game after school with facilitators Felix Kioko (third from left) and Kajungu Mturi (fourth from left). Kioko, from Kenya, and Mturi, from Tanzania, are both students at Eastern Mennonite University, one of four community partners to support the program. Approximately 40 students participate in after-school activities to build skills and introduce them to school and community resources. FOR 15 STUDENTS participating in a resilience training at Eastern Mennonite University, one role-play activity hit close to home. The small-group skits invited them to learn how their actions might be a result of an emotional response: how, for example, teasing Pakistani refugee Hayat Zahra,16, about her hijab might be a result of their own discomfort in a new American culture. “That was hard,” Zahra said later. Though the situation was only acting, her emotional response was visible. The high school students, refugees from Africa and the Middle East who are members of a leadership training program, were then able to talk about how words can hurt and how such hurt might cause other negative behaviors. Harrisonburg High’s Peer Leaders program is a grant-funded project involving partners Eastern Mennonite University, Harrisonburg High School and Church World Service (CWS). James Madison University’s Center for International Stabilization and Recovery leads the program. Monthly sessions alternate between providing information about community and school opportunities and group activities off-campus. Swahili speaker and CJP graduate student Kajungu Mturi, from Tanzania, and Felix Kioko ’17, now a graduate student at CJP, facilitated the group. In spring 2017, Katie Mansfield, director of the Strategies for Trauma Awareness and Resilience (STAR) program, led a day-long workshop about how the body responds to stress and how those responses can lead to unhelpful behaviors. Mansfield, who typically works with adults, said she was inspired by the students’ sensitivity, insights and questions. For this day with 30 high-schoolers, she drew upon her first experiences in peace education with an organization called Peace Games. Mansfield offered arts-based activities, small-group sharing and team-building experiences. EMU resources were also tapped in a fall training with a CJP team that included Professor Johonna Turner; Practice Director Amy Knorr; then-graduate students Mturi, Diana Tovar, Jalal Maqableh; and Jacques Mushagasha MA ’16. In a day soon after the U.S. presidential elections, when many questions had begun to surface, the group helped students explore their questions and strategies for engagement.